I love beauty products and I love self-care, so could I combine these two worlds together? Hello, my name is Jamé, and I am an anxious, beauty-loving person. Between running my own personal brand, constantly working with brands for projects, jetting off to speaking engagements, and trying to have a somewhat normal social life, I. Am. Constantly. Exhausted. And with so much going on, I constantly worry that I'll miss something. One thing that has helped me is putting together an anti-anxiety self-care routine. The beautiful thing about self-care is it's not "one size fits all" and you can tailor it to your liking. I wanted to feel less anxious, get better sleep at night, and spend more time enjoying the present rather than stressing out about the future. Something I noticed is that I always felt relaxed while doing my beauty routine, so it made me wonder: Could I combine self-care with beauty? Could I somehow merge beauty products with lessening stress? My goal was to see if, after a week of trying different things, I could feel less anxious and more energized by combining my two favorite activities: beauty and self-care. Before getting started, I made a list of everything in my self-care routine that could possibly have a beauty component to it. Some things, like adding cleansing oils or face masks into my routine, seemed easy enough. Others, like ditching coffee, limiting alcohol consumption, and forcibly decompressing before bed, were definitely my weak spots. Here's what I learned throughout my week of blending self-care with my beauty routine. My mind is constantly in work mode, so I tried meditation while doing my face sheet masks to focus my thoughts. I felt like listening to someone guiding me through meditation would throw me off, so instead I tried using the Relax Melodies app, which allowed me to customize the sounds I wanted to hear. As someone who naturally loves the sound of rain and thunderstorms, I shifted my settings, put my timer on for 15 minutes, and threw a face mask on as I waited. Taking 15 minutes out of my day to do nothing but moisturize my face and focus on my breathing was INSANELY hard. All I could hear were the sounds of traffic, people shouting, and dogs barking, and my mind kept thinking of what I needed to do. Each day I repeated the action: Meditation app, timer, and face mask. And I immediately saw that every day, I was able to quiet out the external sounds and focus on breathing and positive thoughts. The important thing is to not quit if it doesn't work out the first time. You progressively train your mind to focus. Those few moments of peace have now become mandatory for my daily life. I ditched coffee and most caffeinated drinks for the whole week to see if my skin cleared up and stress went down. I don't think I can stress enough just how much I love coffee. I drink coffee every day and am undeniably cranky when I don't have it. I had heard a long time ago that things like acne, rosacea, and skin inflammation could be caused by coffee. Also, as someone with severe allergies, the histamine in coffee was always working against me, not with me. I chose to stop drinking coffee to see how I felt and how my skin responded. Also, for people with medium to high-levels of anxiety, coffee could work against you: Coffee naturally increases the body's hormonal stress response, cortisone, so all those jitters and anxious feelings you feel? Yep, all scientific. Let me just note right here that quitting was EXTREMELY hard for me. I found myself going through bouts of withdrawal and feeling cranky and sad. I was also feeling super tired at work, mostly because I had always depended on coffee to wake me up. Post-coffee, I learned to swap my coffee intake with healthier alternatives: I started off my mornings with water and lemon, which instantly woke up my digestive system, began drinking herbal teas throughout the day, and forcibly drank more water and juices. On days I was too tired to function, I gave myself a bit of caffeine with a green or black tea. Within a few days I instantly noticed that my skin was brighter, I was able to wake myself up throughout the day, I wasn't running to the bathroom as much, and that I was retaining a LOT more moisture in my skin. While I have gone back to drinking coffee, I have significantly lessened how much I drink, instead sticking with decaf drinks, juices, water, and teas. I listened to podcasts while cleansing my face to get my daily dose of active — and passive — listening. The best part about podcasts, in my opinion, is that you can shift how engaged you are. Sometimes you'll want to listen to every word if it's an intense talk, and other times you can chill as you listen to casual conversations, rants, and funny moments. 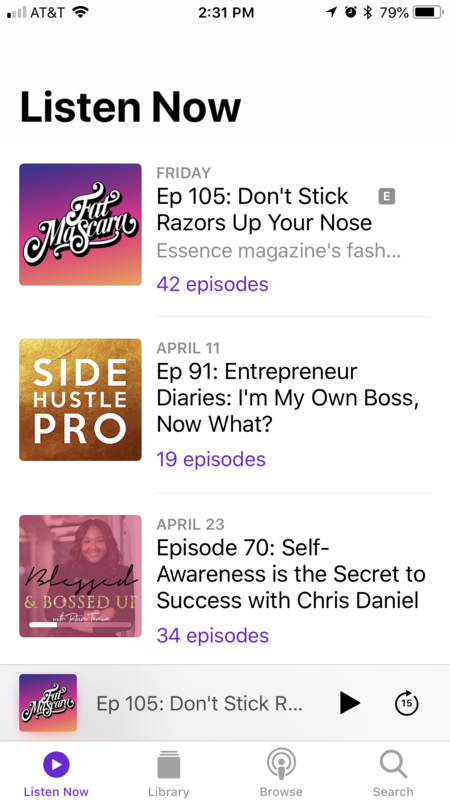 Since I always felt like I never had time to listen to podcast episodes throughout the day, I used the time I spend cleansing and washing my face to listen to an episode or two. Although this may not seem as ~transformative~ as the other notes, one thing this DID is force me to slow down with my nightly routine, mostly because I wanted to keep listening to the podcasts. Also, having something to focus on forced my mind to not think about my infinite to-do list, and I immediately felt less stressed in the long run. 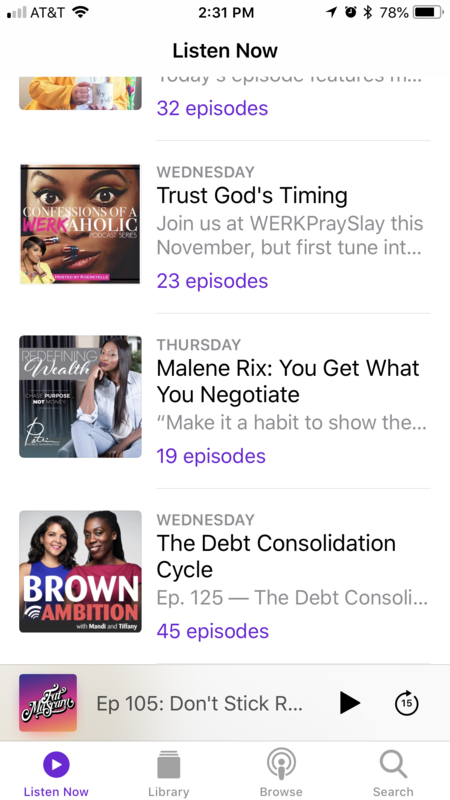 Some of my FAVORITE podcasts are Therapy for Black Girls, Myleik Teele, How I Built This, and Redefining Wealth with Patrice Washington. This is such a simple way to get caught up on episodes while decompressing! I slathered my face with hyaluronic acid and ate water-rich veggies before I went to bed so that I could wake up to fresh, moisturized skin. Not only is hyaluronic acid probably the best thing to happen to skin care, but it literally holds 1000x its weight in water. So not only will it hydrate your skin with the water already in your body, but it pulls water particles from the air. Yaaass. During the week, I wanted to increase my water intake, but drinking a ton of water before bed would mess with my sleep pattern (because I knew I'd be running across the apartment to go to the bathroom). Instead, I ate vegetables like broccoli, celery, and asparagus — all of which are rich in water and release hydration slowly — as late-night snacks. I woke up daily to hydrated skin and no bathroom breaks. Thank me later. And if you're someone who isn't the biggest fan of water, this is an easy-but-healthy way to get more H2O in your body! Lastly, I ditched the late night technology ~itch~, like checking my emails, text messages, or social media, so that I could get more sleep and wake up less anxious. I have always had a chronic problem with constantly checking emails. Even in the late hours of the night, I'll find myself looking through my work and personal emails making sure nothing has come in. Although, what would be coming in at 3 a.m.? Scientifically, the blue light from your computer or phone screen stimulate the hormones that keep you awake, so checking your IG feed, even for 30 seconds can negatively affect your sleep. Every day, I set three main alarms: One that would tell me to stop working (because I'm good at bringing work home with me), one that would remind me to get everything out for the next day, and one final one that would say it's time for bed and to turn on Do Not Disturb.. It was PAINFUL. Especially since I'm naturally a night owl and will look at social media just to pass the time. Furthermore, I couldn't even watch my late-night shows on my laptop! I had to literally lay in my bed and decompress till I fell asleep at night. Thankfully, because I had given myself a few hours in advance to decompress, I soon found myself able to relax and fall asleep easier. Overall, I felt like I hadn't made any extreme changes in my life, but I did feel like a brand new person with a fresh perspective on health and beauty. It goes to show that self-care doesn't have to be insane rituals or heavy-lift projects, nor does it have to be expensive or time-consuming. Honestly, it's about making small changes that teach you how to put yourself, and the time you need to recharge, first. As my mama always said, you can't pour from an empty cup. I noticed that I was much calmer at work, happier to go out with my friends, and could decompress quicker once I got home. I believe everyone should have their own self-care routine, and while you're at it, make it beautiful!